9002892 Stormtrooper Watch is a Star Wars watch released in 2011. 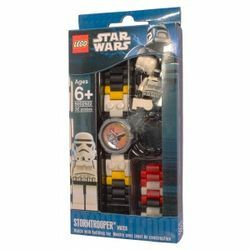 This set contains a watch with a Stormtrooper minifigure. It includes 32 customizable pieces. It is intended for children ages 6 and up. Although the official description lists the item number as 2855057, it features the item number 9002922 on the box. This is a description taken from LEGO.com. Please do not modify it. (visit this item's product page) Let a Stormtrooper™ keep you on time! Build your own LEGO® Star Wars™ watch! Start with the white face, then add black and white links to build the watchband in any pattern you choose. Includes an illustrated image of a LEGO Star Wars Stormtrooper™ minifigure on the face. Watch face features image of LEGO® Star Wars™ Stormtrooper ™ minifigure! Facts about "2855057 Stormtrooper Kid's Watch"
This page was last edited on 9 January 2016, at 06:48.